The Samsung Galaxy Tab 3 tablet. SAMSUNG'S flagship Galaxy S8 is to be launched on March 29 - a month after its normal release at Mobile World Congress in Barcelona. The company decided to delay the release because of the exploding battery fallout from the Galaxy Note 7. The Galaxy S8 is expected to feature a 5.8 inch handset and possibly a 6.2 inch S8+ model. Both phones are tipped to feature an "infinity display", said to cover 83% of their front panel, enabling Samsung to keep them relatively compact. They'll also come with an iris-scanner, a 12-megapixel rear camera and 8-megapixel selfie camera, 4GB of RAM and 64GB of onboard storage. The S8 and S8+ are expected to support wireless charging and feature a new AI virtual assistant called Bixby capable of speaking up to eight different languages. 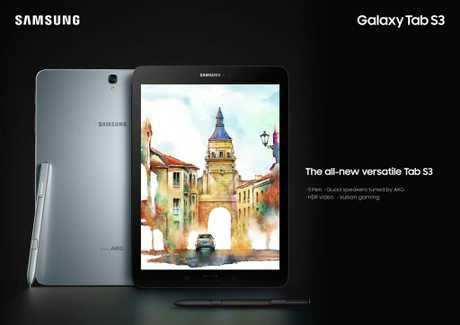 Samsung Electronics has announced the Galaxy Tab S3 and Galaxy Book, the latest expansion of its tablet portfolio. Richard Fink, Vice President, IT & Mobile Division - Samsung Electronics Australia, said the devices would provide great productivity and premium entertainment experiences. "Samsung is committed to offering a range of premium tablet experiences across Windows and Android operating systems and whether people use their device for content creation, consumption, or both." "We're thrilled to announce that the Galaxy Tab S3 will be launched in Australia later in 2017 and will deliver the best experience yet across our Android tablet portfolio. "It's an exceptional device that delivers a beautiful metal and glass design and amazing Super AMOLED and HDR screen, great processor performance, and features that Australians have come to expect from our premium Galaxy range." "The Galaxy Tab S3 is the ultimate in Samsung tablets and will be perfect for Australians seeking the latest we have to offer, whether they use a Wi-Fi or 4G connected variant." "The Galaxy Book range is perfectly suited to support the work, productivity, and entertainment needs of Australians with the functionality of the Windows operating system. It will also come with a new S-pen for a far more refined writing or drawing experience than we have ever delivered." cal network operators to explore ways to extend the great Windows 2-in-1 4G experience to Australians in 2017." Samsung has also today introduced a new level of audio experiences on its Samsung Galaxy devices with the integration of GRAMMY® Award-Winning audio from AKG by HARMAN. • Refined S Pen: the S Pen has a smaller 0.7mm tip and increased pressure sensitivity. The S Pen also includes features such as Screen Off Memo to quickly jot down notes, PDF Annotation for easy editing and professional-level drawing with Advanced Drawing Tools. Both tablets include a 13-megapixel rear camera which includes auto focus and a 5-megapixel front camera for high-quality photos. 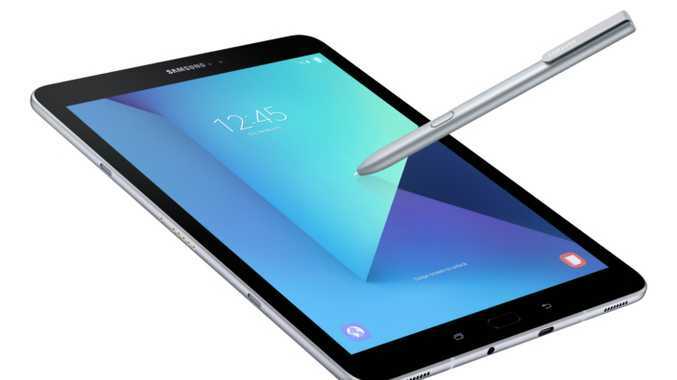 The tablets also include expandable storage* and more power efficiency with fast-charge capabilities, supporting up to 12 hours of video playback on the Galaxy Tab S3 and up to 10.5 hours of video playback on the Samsung Book (12-inch). The Galaxy Tab S3 is the first Samsung tablet to feature quad-stereo speakers tuned by AKG by HARMAN for premium visual and listening experiences. Optimised for gaming, the Galaxy Tab S3 includes Vulkan API for superior graphics and Game Launcher for an enhanced user interface and personalized gaming experience, as well as modes like Do Not Disturb for uninterrupted gameplay. Built on the Windows 10 operating system, the Galaxy Book offers the full desktop Microsoft Office experience. It also features a keyboard that is larger and more tactile with discernible keys so users can comfortably type just as they would on a traditional computing device. IT WAS meant to be a quiet, confident comeback for the world's biggest smartphone maker but environmental protests marred Samsung's Mobile World Congress announcements in Spain this morning. 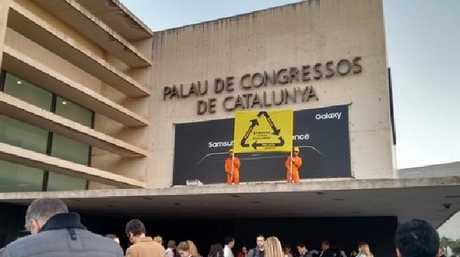 Before the event even began, Greenpeace protesters scaled Samsung's Barcelona venue to hang an 8m banner with the message, "Reuse, recycle, rethink". But one protester later managed to stand on the stage during its delayed event, holding a recycling sign, interrupting the company's announcements. In a blog post, Greenpeace Spain explained the protest was in response to Samsung's lack of commitment to recycle millions of Galaxy Note 7 smartphones recalled last year after a series of fires due to faulty batteries. "Samsung has yet to share a clear plan on how it will manage the 4.3 million phones it has withdrawn," Greenpeace wrote in Spanish. "If Samsung is serious and wants to ensure that this does not happen again, it must lead the industry and evolve into a system that allows phones to be easily repaired, reused and recycled." Perhaps ironically, Samsung Electronics Europe senior vice-president David Lowes had been detailing lessons the smartphone maker had learned from Note 7 recalls when he was forced to walk across the stage and usher the protester away with the words, "I think you've made your point." Mr Lowes said Samsung would institute an eight-point battery check and battery advisory committee to avoid a repeat of the Note 7 failures. "The past six months has undoubtedly been one of the most challenging periods in our history," he said. "We did not meet the high standards we set for ourselves."